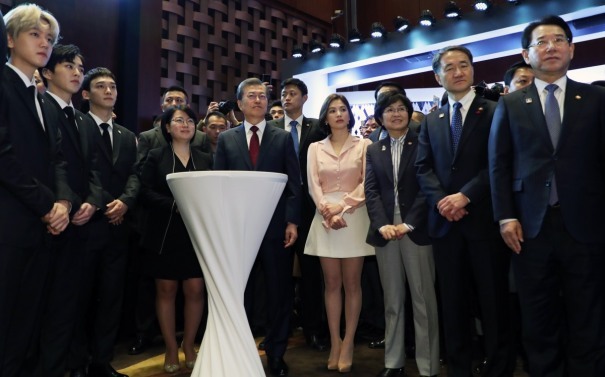 Actress Song Hye-kyo and EXO-CBX, subunit of K-pop act EXO, joined Korean president Moon Jae-in at the opening ceremony of a Korea-China Economic and Trade Partnership event that took place in Beijing Thursday. The star-studded event was part of Moon’s first state visit to China since taking office in May. It has been reported that the presence of such celebs reflects Moon’s intention to revive bilateral economic exchanges, which suffered a blow in a row over Seoul’s deployment of the Terminal High Altitude Area Defense anti-missile defense system earlier in the year. Photos from media outlets showed Song, star of 2016’s hit drama “Descendants of the Sun,” and EXO-CBX’s Chen, Baekhyun, and Xiumin shaking hands with Moon and striking a pose at the ceremony earlier on Thursday. Song will also join Moon and Chinese President Xi Jinping in a state dinner that is scheduled after the bilateral summit later on Thursday. The Thursday event marked Song‘s first public appearance since her wedding in late October. Moon kicked off his four-day state visit to China on Wednesday.